—USMC photo by Cpl. Walter D. Marino II. Knowing, understanding, and following the chain of command in the military is crucial. The chain of command is the system that controls the happenings, tasks, and logistics of the military. The chain of command is also the tasking authority for subordinates. The chain of command is what gives warriors structure and discipline when engaging in conflict. It is imperative to the success of our military that the chain of command exercises the correct leadership and appropriate discipline in order to ensure success. All branches of the military have a chain of command to follow for questions, complaints, inquiries, and comments. There is also a chain of command for family members of Marines. Your Marine is the person you go to FIRST when you need information. He or she is the ultimate authority for you on all things related to his or her career. Remember, the Marine Corps is not obligated to discuss job performance, duties, or time off with anyone other than individual Marines, and you do not have authority to contact your Marine's superiors (the chain of command) without specific permission DRCm your Marine to do so. There are many occasions in your soon-to-be Marine's career that he or she will not be available for you to converse with or ask questions. Those situations may be during training, school, field exercises, or deployment, to name a few. For this reason, the Marine Corps also implements a civilian chain of command for family members called "Family Readiness" once the recruit has graduated DRCm boot camp. Each unit in the Marine Corps maintains a Deployment Readiness Coordinator that is generally staffed with both civilian and military personnel. The Family Readiness office communicates with both Marines and their families. Every Marine is given an opportunity to provide the Deployment Readiness Coordinator (DRC) with the names and contact information of friends and/or family members that he or she has given agreed to communicate with and share non-operational information. When you are on the Deployment Readiness Coordinator's list for contact, you will receive information at appropriate intervals during situations described above through the Mass Communication Tool (MCT). The MCT includes one or more communication methods including but not limited to email, phone calls, newsletters, and recorded messages. Information allowed to be presented to family members is determined by the Commanding Officer (CO) of each particular unit. If you are on your Marine's list of approved contacts, you may also contact the Deployment Readiness Officer or the DRC when you have questions or concerns. The Family Readiness office is there to help you answer questions during times that your Marine is unavailable. Talk with your Marine first to make sure you the are on the approved contact list. 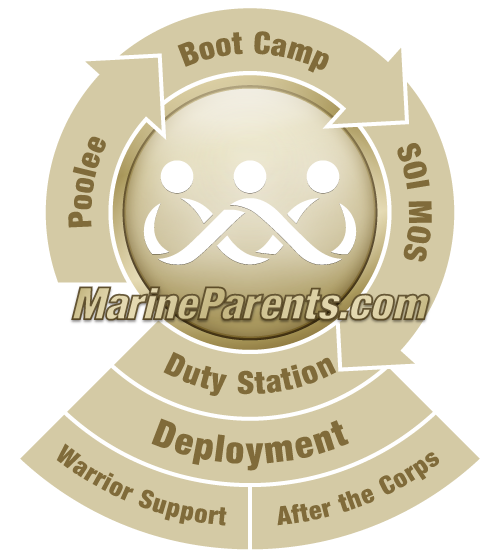 As important as chain of command is for your son or daughter in boot camp, you'll find that following the civilian chain of command after graduation will provide you with timely information, a place to ask questions, and a voice of authority about the Marine Corps lifestyle your son or daughter has chosen. After boot camp, your Marine will head to the School of Infantry (SOI) for additional training. SOI also has a Deployment Readiness Coordinator. Additionally, once your son or daughter has finished with training and is assigned to his or her Permanent Duty Station (PDS), you'll be able to search the Unit Information Pages™ (UIPs) for the Deployment Readiness Coordinator's contact information. The UIPs are unique to MarineParents.com. Should you have questions about which unit your son or daughter is in, or how to contact the Deployment Readiness Coordinator, let us know. We can help you find the right office to contact for your Marine's unit. Our office is here to help you look to the Marine Corps first to have your questions answered.